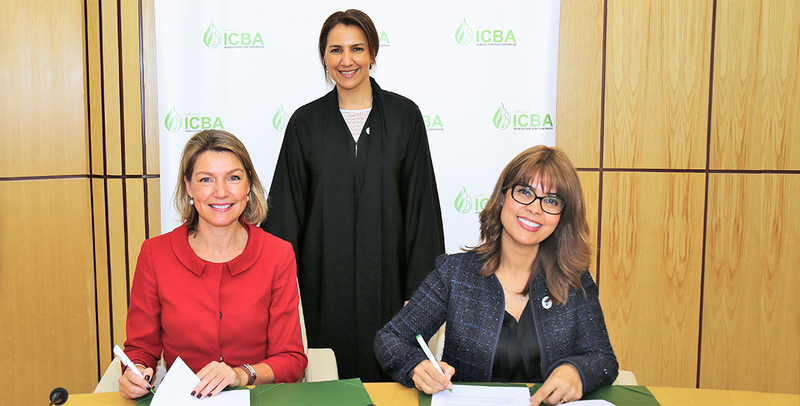 The International Center for Biosaline Agriculture (ICBA) and the International Fund for Agricultural Development (IFAD), a specialized agency of the United Nations, joined forces today to work towards agricultural development and food security in developing countries, contributing to the achievement of the UN Sustainable Development Goals. 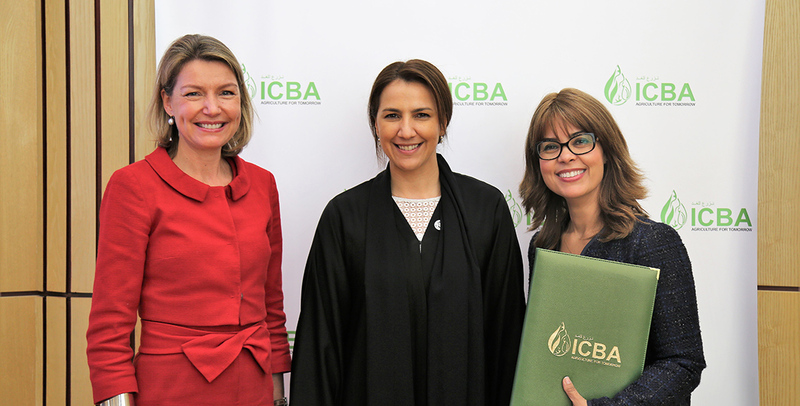 Building on nearly 15 years of strategic collaboration, ICBA and IFAD signed a memorandum of understanding (MoU) to this effect in the presence of Her Excellency Mariam bint Mohammed Almheiri, UAE Minister of State for Future Food Security, at ICBA’s headquarters in Dubai. Under this agreement, the two organizations will, among other things, exchange knowledge and technical expertise, identify projects suitable for possible funding by IFAD and/or other co-funders, and organize knowledge-sharing and capacity-building events on subjects of mutual interest. More specifically, the collaboration will concern such areas as stress-tolerant and climate-resilient crops, land and water management for salinity and sodicity, and climate change mitigation and adaptation in marginal environments. ICBA and IFAD will also work on the use of non-conventional water (e.g. saline and brackish water, treated wastewater, industrial water, agricultural drainage and sea water) for different agricultural and agro-forestry purposes, and seed production and small-scale irrigation systems. As these areas are under ICBA’s mandate, the center has accumulated a wealth of knowledge, experience and technology over nearly 20 years of its work and is well placed to help countries address challenges to agricultural production in marginal environments. “Another key ingredient for food security is embracing advanced technologies and sharing knowledge and expertise. Technology has a major role to play in the quest to promote a sustainable and nutritious food revolution, and we must not only be open to receiving these technologies, but also play an active role in producing them,” Her Excellency Mariam bint Mohammed Almheiri added, lauding the MoU as a significant step in that direction. has so far implemented programs in over 30 countries in the Middle East, North Africa, sub-Saharan Africa, South Asia, Central Asia and the Caucasus. As an applied agricultural research center, ICBA has been working to address current and future risks and problems to agriculture in marginal areas. The main focus has been on identifying, testing and piloting resource-efficient, climate-smart crops and technologies in salt-affected, water-scarce and drought-vulnerable regions. As a result, ICBA has generated extensive applied experience and developed tailor-made solutions to the problems of salinity, water scarcity and drought. The center is thus uniquely positioned to introduce much-needed climate-smart crops and technologies in different parts of the world to alleviate projected food and water crises.